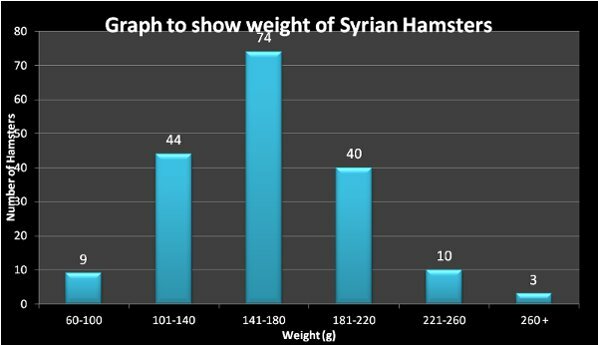 Using a sample of 180 Syrian hamster weights from the Hamster Weigh in Thread(excluding pregnant, ill, or very old/young hamsters), I have calculated that the average weight for a Syrian hamster is 162.3g. In general, Females were heavier than males, most of the largest weights were from females. Hamsters in the lower bands are most likely young/old/petshop hamsters and hamsters in the higher bands are most likely hamsters from breeders, but we would need more information to be able to fully conclude that. Last edited by HorseyMandz; 12-22-2012 at 11:46 AM. Wow I don't know how you did that, just the mention of any maths confuses me xD You're right though and I spent ages worrying that Fudge was underweight when I saw all these hams weighing 200-300g and she's just under 130g but she's a pet shop ham and looking at her and what she eats, that's healthy for her. I confused myself while doing it .... I had to get Dad to come help me. I might use it for a school project I have to do on how maths can apply in a useful way to real life! You are far too dedicated it is interesting how large the range is though. I know, I had to go back and check I hadn't put any WWs or Chineseys in there by mistake! Very interesting I love doing things like that. Have you put any graphs together? as I don't mind helping out if you send me the excel file? I haven't put any graphs together but I guess that would be a good idea. Could you sticky this thread as I think it would really help people out? Added a graph. If anyone would like me to do an analysis like this for dwarfies, let me know... there isn't as much data but I would happily give it a go! Last edited by HorseyMandz; 12-22-2012 at 11:47 AM.